By end of the month the ArtisTree Plein Air Group will wrap up our second successful year painting together. 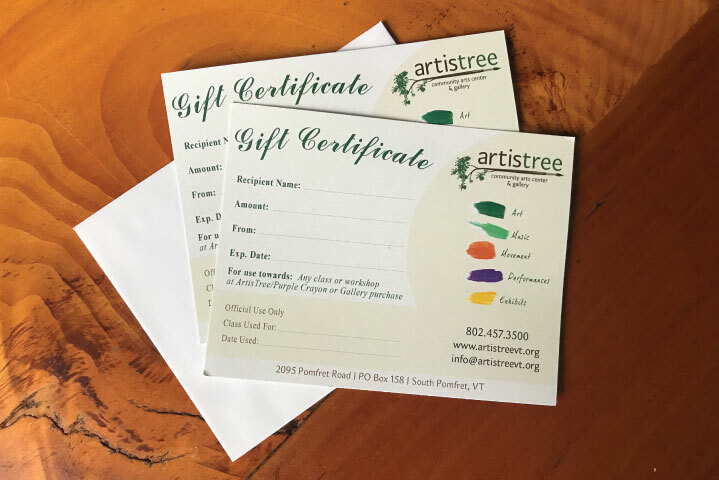 The group consists of 25 local artists who paint outside each Friday from May to October, all with the intention of capturing the beauty of the mountains, streams, barns and quaint villages of Vermont on canvas. As the facilitator of the group, I wanted to give you all an inside scoop into our adventures over the past few months, which include some photos taken on location, along with some pieces I painted along the way. I hope you enjoy the colorful adventures, and that it inspires you to someday venture outdoors with your paintbrushes. Among our first weeks, we visited one of the oldest farmsteads in Pomfret, VT to paint the cows and historic barn. 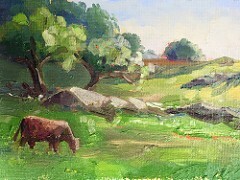 Here one of two small oil paintings I completed on site that morning. Next we showed our love of our local library by painting the Norman Williams Public Library as part of the state wide Love Your Library series which will feature an exhibit that opens in January 2019. Next we painted at Kiss the Cow Farm, which is a raw dairy farm in Barnard, VT. 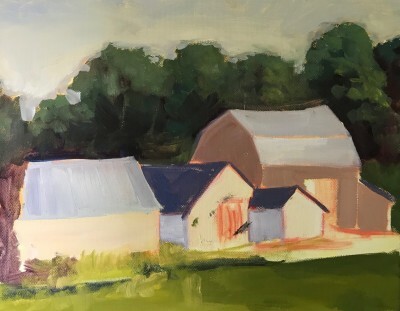 Here is an image of the blocked in stage of a painting, featuring the main house and barn buildings on the farm. 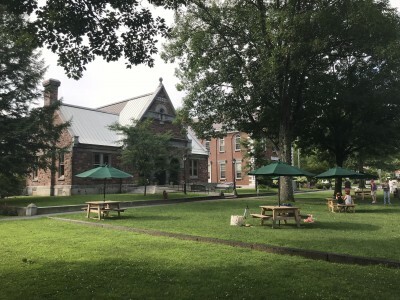 Next, on a beautiful summer morning we got to experience The Kelly Way Gardens of the Woodstock Inn in their full majesty. We explored the vegetables and flower gardens, along with the magical gourd walkway. 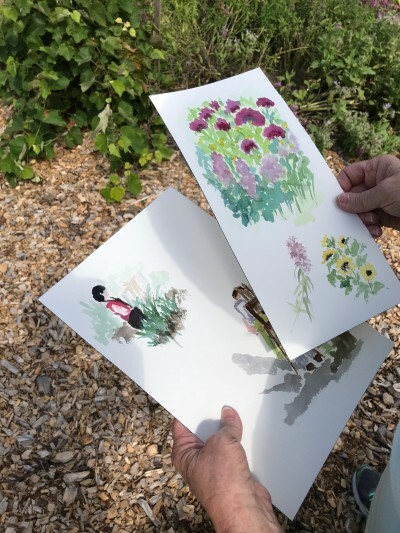 These are some watercolor sketches by Nancy, a group member, done that day. 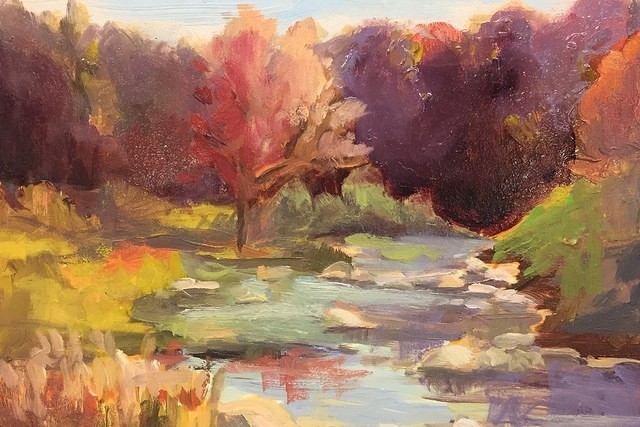 Then as we moved into fall we headed over to Joan Hoffman's house, another group member, to tour her studio and paint along the White River at her beautiful home. 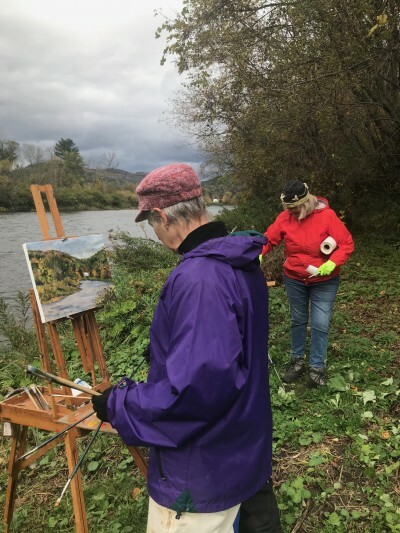 This photo features Joan and Rae painting by the White River. As the weather turns colder, we will head indoors for some indoor studio time and will re-emerge again in May of 2019. 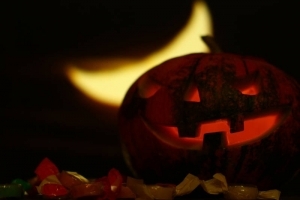 I hope you will join us one of these days! For more information on the group click here.